The original U.S. Constitution, prior to the Civil War contained an amendment that prevented titles of nobility or double allegiances. In today's world, it seems paranoid to prevent someone from having a dual citizenship, but as the following extensive history details, there is a very good reason for this. Setting the context for this story is essential to understanding why these early Americans found it necessary to add the amendment. At the time, the threat from foreign banking powers, hidden under the guise of legal professionals and their bar associations, was considered of chief importance. The colonists experienced all manner of currency manipulation when they began to print their own debt-free money known as Colonial Script. This move by the colonists was antithetical to the Rothschild controlled British Crown, which issued debt-money to the colonies from the beginning. In response, the Crown covertly began counterfeiting Colonial Script, which devalued the currency, and eventually compelled the colonists to declare independence. This aspect of the story is foundational to understanding why later generations, in the early 1800s, decided to add the 13th amendment which sought to prevent interference from foreign interests. Unlike what some economists contend, the lack of gold based money in the early colonies was not the reason Colonial Script was devalued, it was currency manipulation on the part of the British, as the above linked article and documentary detail. After the Civil War, banking powers quietly purge nearly all traces of the original constitution and replaced it with a version that removed the Title of Nobility amendment. In a master stroke of press relations or propaganda, they told the people the 13th amendment freed the slaves when it actually legalized slavery for everyone. For years the original 13th amendment was almost completely wiped from the annals of history, but apparently evidence of its ratification was uncovered in 1991, after a nearly 10 years of research. This article goes well with a five part series on the True History of America. The 13th Amendment to the Constitution of the United States has been altered from its original in order to fool the American public into accepting a government that is mostly illegally in office. The information contained in the article below contains stunning revelations that the entire U.S. congress should be deemed illegitimate, after evidence that a clandestine plot to alter the U.S. Constitution has now emerged. By chance, they discovered the library’s oldest authentic copy of the Constitution of the United States (printed in 1825). Both men were stunned to see this document included a 13th Amendment that no longer appears on current copies of the Constitution. Moreover, after studying the Amendment’s language and historical context, they realized the principle intent of this “missing” 13th Amendment was to prohibit lawyers from serving in government. So began a seven year, nationwide search for the truth surrounding the most bizarre Constitutional puzzle in American history — the unlawful removal of a ratified Amendment from the Constitution of the United States. At the first reading, the meaning of this 13th Amendment (also called the “title of nobility” Amendment) seems obscure; unimportant. The references to “nobility,” “honour,” “emperor,” “king,” and “prince,” lead us to dismiss this Amendment as a petty post-revolution act of spite directed against the British monarchy. The U.S. modern world of Lady Di and Prince Charles, make anti-royalist sentiments seem so archaic and quaint, that the Amendment can be ignored. Second, although already prohibited by the Constitution, an additional “title of nobility” amendment was proposed in 1789, again in 1810, and according to Dodge, finally ratified in 1819. Clearly, the founding fathers saw such a serious threat in “titles of nobility” and “honors” that anyone receiving them would forfeit their citizenship. Since the government prohibited “titles of nobility” several times over four decades, and went through the amending process (even though “titles of nobility” were already prohibited by the Constitution), it’s obvious that the Amendment carried much more significance for our founding fathers than is readily apparent today. To understand the meaning of this “missing” 13th Amendment, we must understand its historical context — the era surrounding the American Revolution. We tend to regard the notion of “Democracy” as benign, harmless, and politically unremarkable. But at the time of the American Revolution, King George III and the other monarchies of Europe saw Democracy as an unnatural, ungodly ideological threat, every bit as dangerously radical as Communism was once regarded by modern Western nations. Just as the 1917 Communist Revolution in Russia spawned other revolutions around the world, the American Revolution provided an example and incentive for people all over the world to overthrow their European monarchies. Even though the Treaty of Paris ended the Revolutionary War in 1783, the simple fact of our existence threatened the monarchies. The United States stood as a heroic role model for other nations, that inspired them to also struggle against oppressive monarchies. The French Revolution (1789-1799) and the Polish national uprising (1794) were in part encouraged by the American Revolution. Though we stood like a beacon of hope for most of the world, the monarchies regarded the United States as a political typhoid Mary, the principle source of radical democracy that was destroying monarchies around the world. The monarchies must have realized that if the principle source of that infection could be destroyed, the rest of the world might avoid the contagion and the monarchies would be saved. Their survival at stake, the monarchies sought to destroy or subvert the American system of government. Knowing they couldn’t destroy us militarily, they resorted to more covert methods of political subversion, employing spies and secret agents skilled in bribery and legal deception — it was, perhaps, the first “cold war”. Since governments run on money, politicians run for money, and money is the usual enticement to commit treason, much of the monarchy’s counter- revolutionary efforts emanated from English banks. lawyers is not a recent phenomenon. This abuse is a human tradition that predates the Bible and spread from Europe to America despite early colonial prohibitions. According to the Tennessee Laws (1715-1820, vol. II, p. 774), in the 1794 Jay Treaty, the United States agreed to pay 600,000 pounds sterling to King George III, as reparations for the American revolution. The Senate ratified the treaty in secret session and ordered that it not be published. When Benjamin Franklin’s grandson published it anyway, the exposure and resulting public uproar so angered the Congress that it passed the Alien and Sedition Acts (1798) so federal judges could prosecute editors and publishers for reporting the truth about the government. Since we had won the Revolutionary War, why would U.S. Senators agree to pay reparations to the loser? And why would they agree to pay 600,000 pounds sterling, eleven years after the war ended? It doesn’t make sense, especially in light of Senate’s secrecy and later fury over being exposed, unless we assume U.S. Senators had been bribed to serve the British monarchy and betray the American people. That’s subversion. The United States Bank had been opposed by the Jeffersonians from the beginning, but the Federalists (the pro-monarchy party) won out in its establishment. The initial capitalization was $10,000,000 — 80% of which would be owned by foreign bankers. Since the bank was authorized to lend up to $20,000,000 (double its paid in capital), it was a profitable deal for both the government and the bankers since they could lend, and collect interest on, $10,000,000 that didn’t exist. However, the European bankers outfoxed the government and by 1796, the government owed the bank $6,200,000 and was forced to sell its shares. (By 1802, the U.S. government owned no stock in the United States Bank.) The sheer power of the banks and their ability to influence representative government by economic manipulation and outright bribery was exposed in 1811, when the people discovered that European banking interests owned 80% of the bank. Congress therefore refused to renew the bank’s charter. This led to the withdrawal of $7,000,000 in specie by European investors, which in turn, precipitated an economic recession, and the War of 1812. That’s destruction. There are undoubtedly other examples of the monarchy’s efforts to subvert or destroy the United States; some are common knowledge, others remain to be disclosed to the public. For example, David Dodge discovered a book called “2 VA LAW” in the Library of Congress Law Library. According to Dodge, “This is an un-catalogued book in the rare book section that reveals a plan to overthrow the constitutional government by secret agreements engineered by the lawyers. That is one of the reasons why this Amendment was ratified by Virginia and the notification was lost in the mail. There is no public record that this book exists.” That may sound surprising, but according to The Gazette (5/10/91), “the Library of Congress has 349,402 un-catalogued rare books and 13.9 million un-catalogued rare manuscripts.” There may be secrets buried in that mass of documents even more astonishing than a missing Constitutional Amendment. In Colonial America, attorneys trained attorneys but most held no “title of nobility” or “honor”. There was no requirement that one be a lawyer to hold the position of district attorney, attorney general, or judge; a citizen’s “counsel of choice” was not restricted to a lawyer; there were no state or national bar associations. The only organization that certified lawyers was the International Bar Association (IBA), chartered by the King of England, headquartered in London, and closely associated with the international banking system. Lawyers admitted to the IBA received the rank “Esquire” — a “title of nobility”. “Esquire” was the principle title of nobility which the 13th Amendment sought to prohibit from the United States. Why? Because the loyalty of “Esquire” lawyers was suspect. Bankers and lawyers with an “Esquire” behind their names were agents of the monarchy, members of an organization whose principle purposes were political, not economic, and regarded with the same wariness that some people today reserve for members of the KGB or the CIA. Article 1, Sect. 9 of the Constitution sought to prohibit the International Bar Association (or any other agency that granted titles of nobility) from operating in America. But the Constitution neglected to specify a penalty, so the prohibition was ignored, and agents of the monarchy continued to infiltrate and influence the government (as in the Jay Treaty and the US Bank charter incidents). Therefore, a “title of nobility” amendment that specified a penalty (loss of citizenship) was proposed in 1789, and again in 1810. The meaning of the amendment is seen in its intent to prohibit persons having titles of nobility and loyalties to foreign governments and bankers from voting, holding public office, or using their skills to subvert the government. If this interpretation is correct, “honor” would be the key concept in the 13th Amendment. Why? Because, while “titles of nobility” may no longer apply in today’s political system, the concept of “honor” remains relevant. For example, anyone who had a specific “immunity” from lawsuits which were not afforded to all citizens, would be enjoying a separate privilege, an “honor”, and would therefore forfeit his right to vote or hold public office. Think of the “immunities” from lawsuits that U.S. judges, lawyers, politicians, and bureaucrats currently enjoy. As another example, think of all the “special interest” legislation the U.S. government passes: “special interests” are simply euphemisms for “special privileges” (honors). If the missing 13th Amendment were restored, “special interests” and “immunities” might be rendered unconstitutional. The prohibition against “honors” (privileges) would compel the entire government to operate under the same laws as the citizens of this nation. Without their current personal immunities (honors), US judges and I.R.S. agents would be unable to abuse common citizens without fear of legal liability. If this 13th Amendment were restored, the entire U.S. Government would have to conduct itself according to the same standards of decency, respect, law, and liability as the rest of the nation. If this Amendment and the term “honor” were applied today, U.S. Government’s ability to systematically coerce and abuse the public would be all but eliminated. Imagine! A government without special privileges or immunities. How could we describe it? It would be … almost like … a government … of the people … by the people … for the people! Imagine: a government … whose members were truly accountable to the public; a government that could not systematically exploit its own people! It’s unheard of … it’s never been done before. Not ever in the entire history of the world. Bear in mind that Senator George Mitchell of Maine and the U.S. National Archives concede this 13th Amendment was proposed by Congress in 1810. However, they explain that there were seventeen states when Congress proposed the “title of nobility” Amendment; that ratification required the thirteen states, but since only twelve states supported the Amendment, it was not ratified. The Government Printing Office agrees; it currently prints copies of the Constitution of the United States which include the “title of nobility” Amendment as proposed, but un-ratified. Even if this 13th Amendment were never ratified, even if Dodge and Dunn’s research or reasoning is flawed or incomplete, it would still be an extraordinary story. Can you imagine, can you understand how close the US came to having a political paradise, right here on Earth? Do you realize what an extraordinary gift our forebears tried to bequeath us? And how close we came? One vote. One state’s vote. The federal government concedes that twelve states voted to ratify this Amendment between 1810 and 1812. But they argue that ratification require thirteen states, so the Amendment lays stillborn in history, unratified for lack of a just one more state’s support. One vote. David Dodge, however, says one more state did ratify, and he claims he has the evidence to prove it. Then, four years later, on December 31, 1817, the House of Representatives resolved that President Monroe inquire into the status of this Amendment. In a letter dated February 6, 1818, President Monroe reported to the House that the Secretary of State Adams had written to the governors of Virginia, South Carolina and Connecticut to tell them that the proposed Amendment had been ratified by twelve States and rejected by two (New York and Rhode Island), and asked the governors to notify him of their legislature’s position. (House Document No. 76) (This, and other letters written by the President and the Secretary of State during the month of February, 1818, note only that the proposed Amendment had not yet been ratified. However, these letters would later become crucial because, in the absence of additional information they would be interpreted to mean the amendment was never ratified). communicate the ratification of amendments. Word of Virginia’s 1819 ratification spread throughout the States and both Rhode Island and Kentucky published the new Amendment in 1822. Ohio first published in 1824. Maine ordered 10,000 copies of the Constitution with the 13th Amendment to be printed for use in the schools in 1825, and again in 1831 for their Census Edition. Indiana Revised Laws of 1831 published the 13th Article on p. 20. Northwestern Territories published in 1833. Ohio published in 1831 and 1833. Then came the Wisconsin Territory in 1839; Iowa Territory in 1843; Ohio again, in 1848; Kansas Statutes in 1855; and Nebraska Territory six times in a row from 1855 to 1860. So far, David Dodge has identified eleven different states or territories that printed the Amendment in twenty separate publications over forty-one years. And more editions including this 13th Amendment are sure to be discovered. Clearly, Dodge is onto something. You might be able to convince some of the people, or maybe even all of them, for a little while, that this 13th Amendment was never ratified. Maybe you can show them that the ten legislatures which ordered it published eighteen times we’ve discovered (so far) consisted of ignorant politicians who don’t know their amendments from their… ahh, articles. You might even be able to convince the public that our U.S. forefathers never meant to “outlaw” public servants who pushed people around, accepted bribes or special favors to “look the other way.” Maybe. But before you do, there’s an awful lot of evidence to be explained. It’s not yet clear whether the 13th Amendment was published in Laws of the United States, 1st Vol., prematurely, by accident, in anticipation of Virginia’s ratification, or as part of a plot to discredit the Amendment by making it appear that only twelve States had ratified. Whether the Laws of the United States Vol. 1 (carrying the 13th Amendment) was re-called or made-up is unknown. In fact, it’s not even clear that the specified volume was actually printed — the Law Library of the Library of Congress has no record of its existence. However, because the noted authors reported no further references to the 13th Amendment after the Presidential letter of February, 1818, they apparently assumed the ratification process had ended in failure at that time. If so, they neglected to seek information on the Amendment after 1818, or at the state level, and therefore missed the evidence of Virginia’s ratification. This opinion — assuming that the Presidential letter of February, 1818, was the last word on the Amendment — has persisted to this day. However, despite Clayton’s opinion, the Amendment continued to be published in various states and territories for at least another eleven years (the last known publication was in the Nebraska territory in 1860). Once again the 13th Amendment was caught in the riptides of American politics. South Carolina seceded from the Union in December of 1860, signaling the onset of the Civil War. In March, 1861, President Abraham Lincoln was inaugurated. In other words, President Lincoln had signed a resolve that would have permitted slavery, and upheld states’ rights. Only one State, Illinois, ratified this proposed amendment before the Civil War broke out in 1861. In the tumult of 1865, the original 13th Amendment was finally removed from the US Constitution. On January 31, another 13th Amendment (which prohibited slavery in Sect. 1, and ended states’ rights in Sect. 2) was proposed. On April 9, the Civil War ended with General Lee’s surrender. On April 14, President Lincoln (who, in 1861, had signed the proposed Amendment that would have allowed slavery and states rights) was assassinated. On December 6, the “new” 13th Amendment loudly prohibiting slavery (and quietly surrendering states rights to the federal government) was ratified, replacing and effectively erasing the original 13th Amendment that had prohibited “titles of nobility” and “honors”. 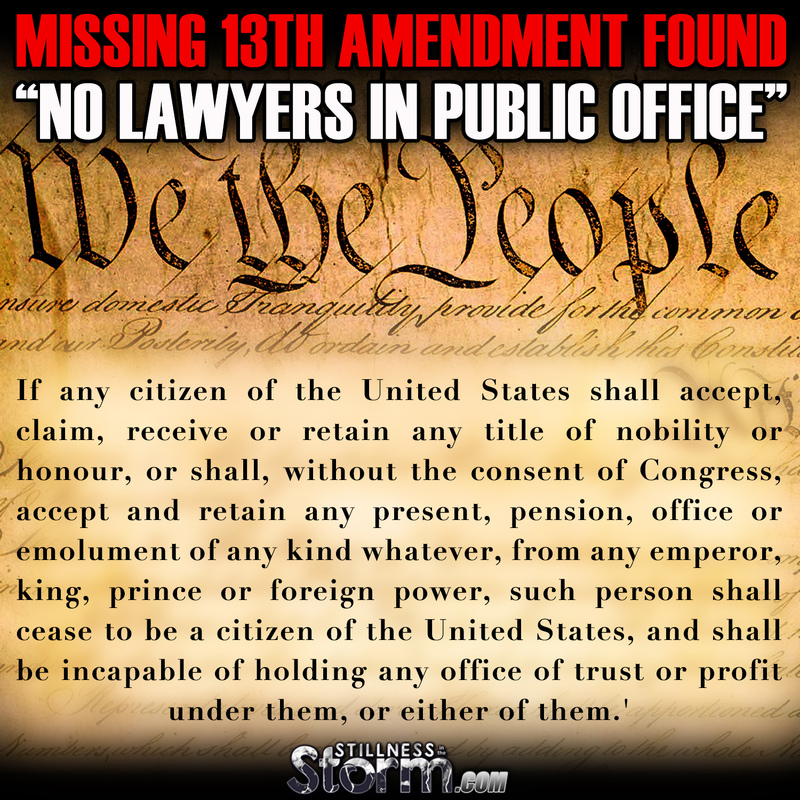 To create the present oligarchy (rule by lawyers) which the U.S. now endures, the lawyers first had to remove the 13th “titles of nobility” Amendment that might otherwise have kept them in check. In fact, it was not until after the Civil War and after the disappearance of this 13th Amendment, that American bar associations began to appear and exercise political power. Since the unlawful deletion of the 13th Amendment, the newly developing bar associations began working diligently to create a system wherein lawyers took on a title of privilege and nobility as “Esquires” and received the “honor” of offices and positions (like district attorney or judge) that only they could hold. By virtue of these titles, honors, and special privileges, lawyers have assumed political and economic advantages over the majority of U.S. citizens. Through these privileges, they have nearly established a two-tiered citizenship in this nation where a majority may vote, but only a minority (lawyers) may run for political office. This two-tiered citizenship is clearly contrary to Americans’ political interests, the nation’s economic welfare, and the Constitution’s egalitarian spirit. The significance of this missing 13th Amendment and its deletion from the Constitution is this: Since the amendment was never lawfully nullified, it is still in full force and effect and is the Law of the land. If public support could be awakened, this missing Amendment might provide a legal basis to challenge many existing laws and court decisions previously made by lawyers who were unconstitutionally elected or appointed to their positions of power; it might even mean the removal of lawyers from the current US government system. At the very least, this missing 13th Amendment demonstrates that two centuries ago, lawyers were recognized as enemies of the people and nation. Some things never change. No doubt Washington’s warning and Jefferson’s ideas were dismissed as redundant by those who knew the law. Who would have dreamed the U.S. legal system would become a monopoly against freedom when that was one of the primary causes for the rebellion against King George III? We await the inevitable convulsion. Only two questions remain: Will we fight to revive our rights? Or, Will we meekly submit as our last remaining rights expire, surrendered to the courts, and perhaps to a “new world order”?